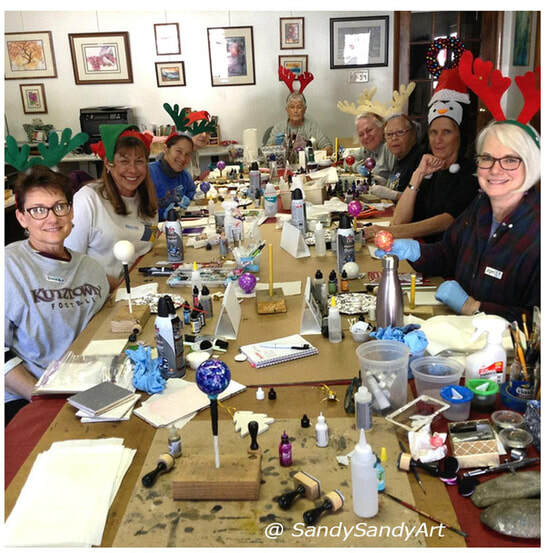 Alcohol Ink online classes with Sandy Sandy from beginner through advanced. Take your alcohol ink art to the next level and experience the FUNdamentals of alcohol ink. "Let there be more joy and laughter in your living!" July 23 - Watercolor on Yupo! Sign Up for the Preferred Workshop and ECourse Email List here. With Alcohol Inks, there's no need for prior art experience of any kind! Employ pouring, painting and stamping techniques while using all the tools that will instantly get you creating your own captivating, vibrant Alcohol Ink paintings. All supplies needed are included in the *$59.00 starter kit. Tiles, display easels, Yupo paper and mats are included in the workshop fee, so you'll leave with your own ready to display masterpieces. To register, use the BUY NOW button for the workshop you want to attend. If you prefer to pay by check or cash call Sandy at 609-268-9106 to make arrangements and reserve your spot. Workshop Policies: If the workshop is cancelled, 100% of fees will be returned. For participant cancellations, more than 10 days before the start date, a full credit will be applied to future classes. If the cancellation is made 10 days or less from the beginning date of workshop, 30% of workshop fees will be credited towards future classes. Any difference in price will be paid by or credited to the participant at the time of the make-up class.